Market Dojo can help you get more out of your eSourcing activities. Whether you're looking to run Open, Ranked or Japanese Reverse Auctions. Learn how you can run rapid reverse auctions for as little as £500 per month. Discover how you can use complex functionality such as scenario analysis and weighting. What is e-auction in Procurement? E-Sourcing software is a technology that enables e-auction in procurement and enables companies to get more sourcing and savings with e-sourcing tools in an intuitive way. E-sourcing software helps you conduct market research for purchase requests, adopt policies and parameters of suppliers, control sourcing requirements, manage bid strategy, run reverse auction events and award to suitable suppliers as strategic sourcing. What is reverse auction software? Reverse auction software enables procurement professionals to carry reverse auctions to drive suppliers and reduce costs. Reverse auction software allows buyers to communicate with sellers to refine their bids or contract requirements. Market Dojo extends your procurement capabilities and lets you run an e-auction in no time. Market Dojo’s experts will help you to run your first e-auction event. What service does Market Dojo Provides? Market Dojo offers a vast array of capabilities that help procurement professionals get the most out of their e-sourcing activities with our easy to use and intuitive reverse auction software immediately. Designed by procurement specialists, our solutions aim to help you centralise your information and negotiate the best value for your goods and services. 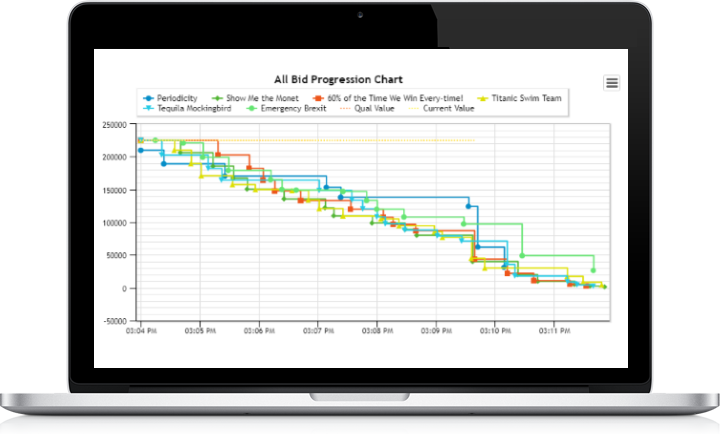 Run on-demand forward or reverse auction events to ensure that you are reaching the market price. Use event templates or clone events for repeatability. Pause, Terminate or Extend your live auctions for full control. Use multiple auctions types to ensure that you are using the best sourcing strategy for your category.